This is a 13-day long cleanse. 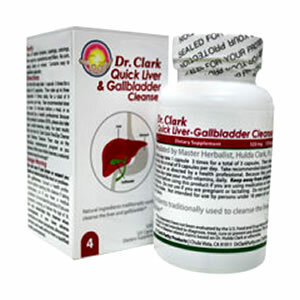 The Dr. Clark Quick Liver & Gallbladder consists of a group of herbs and nutraceuticals that work in a synergistic manner for optimal cleansing. All products in this cleanse are made in accordance with both cGMP and Dr. Hulda Clark’s protocols. Everything you eat, drink, breathe and absorb through your skin is purified and detoxified in your liver. When your liver is overwhelmed, your whole body pays the price. You feel tired and heavy. You lose your vitality. The Dr. Clark Quick Liver & Gallbladder Cleanse contains time-tested natural ingredients that have been specifically created to keep your liver healthy and clear of obstructions, and helps lighten the load on your liver and gallbladder with a systematic cleanse that helps maintain your liver’s vitality. Your body produces and eliminates waste every second. You can see your body releasing toxins in four different ways: through the lungs by breathing, the skin by perspiration, the kidneys by passing urine, and the large intestine by bowel movements. Your invisible detox organ is your liver. Your liver is the most important organ in the body. It has everything to do with how you live - that’s why it’s called the liver. Your liver condition can actually tell you how long you will live and how well you look and feel. You have two main filters for detoxification. The first one is your liver. Your blood carries nutrients and waste from the digestive system through your liver filter, your liver breaks down the toxins and absorbs the nutrients. Your blood travels out of your liver, partly clean, into your kidneys, your second main filter. Your kidneys keep your nutrients in the bloodstream but relieve toxins through urination. The Only Liver Flush on retail shelves. Why is it important to clean our liver and gallbladder? Everything you eat, drink, breathe, and absorb through your skin is purified and detoxified in your liver. Your body is polluted every day with harmful chemicals. Always take on an empty stomach at least 13 minutes before a meal or as directed by a health care professional. The first day take 1 capsule 3 times. From then on take 3 caps 3 times daily. For best results stay on the ParaZap Maintenance and Digestive Aid Program throughout the Liver Cleanse. The greatest benefits perform the Liver & Gallbladder Flush after completing this Liver& Gallbladder Cleanse. After your initial cleanse, a seasonal cleanse is recommended.